Prior to the start of laying ballast in the Broadway headshunt, we were asked to excavate the siding leading to the former horse dock. This is the area we are talking about. It's a a bit hard to see, but the siding that led to the horse dock, now swallowed up by the platform extension to 10 coach lengths, runs to the centre left, and was filled in with excavation material from the platform foundations a few years back. There's a huge pile of clay in there. It is intended to place two 20ft containers here, when the space has been freed. This picture of 5089 Westminster Abbey was taken by Brian a few days after his 12th birthday, so please excuse the lack of perfect clarity. It was with a brand new camera too. To the story then: In front of us is the horse dock, which buffered up to the wall on the right. 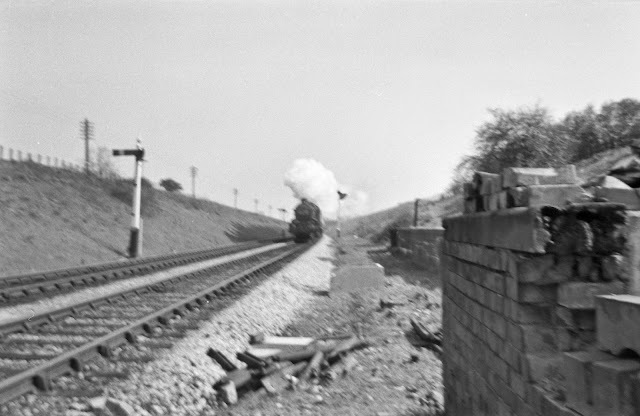 The siding leading up to it came off a crossover from the mainline (recently taken out at the date of the picture) and ran the other way into a headshunt just beyond the signal post in the centre. Today, the area that includes the wall has been filled in by the platform 1 extension, and the area beyond, the shunting neck, was infilled with excavation material. To remove this was the job for the next couple of days. On Wednesday Steve started to dig a trench across the infill, to show our civil engineer what was infill, and what was original cutting side surface. There's a big green lump out there. We got the OK to carry on. We had a hired-in 6t dumper on the go as well, and took all the excavated infill down to the future car park site. Nearing the end of the afternoon on Wednesday, we had already taken out a large chunk of material, although it's a bit hard to see the effect on this picture. While this was going on, Andy from the PWay dept. strode off into the distance to check out the area to be surveyed. This is where two buffer stops, and two turnouts will go, giving the effect of a double track main line. The white topped posts on the right will have cross bars attached to them to indicate the levels to be achieved with either Type 1 or ballast infill. Here is Andy again, this time assisted by two members of the Broadway gang in the distance. Looking through his surveying instrument, Andy is giving them instructions by walkie-talkie to raise or lower the cross bars indicating the levels. Steve and the dumper driver are trying to avoid parking in his line of sight, not always successfully. Our contractor also had a go at looking through the viewfinder. In the background, a board director and one of our civil engineers are discussing the issues. The fall here in BR days was 1 in 200 towards Willersey, starting somewhere near the middle of the new platform. We have to stay level now however, until we get to the new end, behind the camera. We took away 20 loads on Wednesday. Good, but not good enough. It was decided to hire in a second dumper, with a second volunteer driver, John. Using two volunteer drivers keeps down costs. As you can see, all the surfaces exposed are black. This is locomotive ash, so not (yet) the original surface of the cutting side. It's all infill. Much of it was locomotive ash and spent ballast, topped by clay from the platform excavation a few years back, and rubbish such as bedsprings, a carpet, a bicycle tire and, surprise, a steam locomotive pricker. This only emerged when the load was tipped in the car park, and on top of the pile was the recogniseable 'pig's tail' that marked the end of the handle. We fished that out, and have already found willing takers in the Toddington loco dept. This second view from the end of the platform (see above for yesterday's) shows that the headshunt siding is at last starting to appear, in the foreground. There's now quite a bit of spare ground appearing. This shot shows you the layers that we are exposing. The grey layer at the back is clay from the platform excavations dumped here. Under it, slightly pinkish, is spent ballast from BR days. The black area in the centre is the actual bed of the siding, on which the sleepers rested. A few more scoops in this same area, and to our surprise we exposed a catch pit, in good condition, that we had not expected at all. It makes sense though. It was right next to the end of the headhunt, where the buffer stop for it would have been. The pit was still live, and it connected to a trackside drain behind the camera that Andy P had already cleaned and beefed up. It will be inspected by a crawler camera and taken back into service. Happy days - as the mini digger manoeuvered to get above the newly discovered catch pit, a track was wrenched off by a small tree stump. Heck - this was the second mishap of the day. The first was a siren call from the newly hired dumper. It signalled (after some investigation) that the radiator was - empty ! It had only been going for a couple of hours too. We filled it up with water, and it behaved itself for the rest of the day. But what to do with the caterpillar track? By means of a spanner and a grease gun, Steve had the track back on its guide wheel in half an hour. We carried on digging, doing about 30 trips in total today. Here's John on one of the 30 trips. It takes a fair bit of skill to steer the dumper reliably, hour after hour, through the narrow passage that is the upside track, leading to the northern area where the first new rail will be laid. At the end of the day, we had excavated about 80 % of the old infill. The green slope at the top is original; it now continues normally through the black coloured area that we have revealed. The cross section on the right shows how much material was dumped here. We'll be back on Friday to finish the job. Then it's a wait to hear how much the experts say we have to add here with type 1 or fresh ballast, to recover the original trackbed bottom of the main lines in the foreground. But first,we had to get rid of the muddy job, and we are nearly there. Then we can talk about fresh ballast. Good news too from the PWay gangs, we are going to resume track laying on Saturday. The Wednesday gang came up trumps with a fully loaded sleeper train, so there's no holding us back now. A fantastic update and photos to match! Many thanks. A great idea to utilise valuable space to put necessary storage/accommodation for Broadway Station which will tucked away discreetly north of the station. The loco fire pricker was a great find. You might even find a Dean Goods 0-6-0 that it belonged to if you keep digging! Toddington Ted. TT's remarks are good! yes great pictures and a very informative write up of the activities there, thee will be test trains at Broadway soon. Great work everyone. Still think you could put some (redundant) track where you intend to place the containers, then you could place a rail vehicle there instead of the containers that you mention. I'm sure Winchcombe C & W would only be too pleased for a vehicle or two to be outstationed from their yard, and it would look more in keeping, 1930's wise. Just a thought. Regards, Paul. Yes!.Paul,from St Blazey,has a good idea,there!.A,dock siding,with a couple of vans,and a horsebox,would look good!.Still!.I,suppose the Broadway Group need somewhere to put their containers!.Great to hear,that tracklaying,is soon to resume!.Right Away,from Peasebrook,to Childswickham Bridge!. Generally stored vehicles aren't in a fit state to relocate as far as I can tell. Plus they already serve a valuable storage and access role where they live now. I'm inclined to agree that after all of the fantastic work to re-create the station, what a shame to then put containers just at the end of the platforms. Please please think again. Just a reminder to everyone that Broadway Station probably won't be finished when it opens in 2018. There is still Platform 2 waiting room and the footbridge stairwell to fund. So equipment and material will have to be stored somewhere at least for a while. Cheltenham Race Course Station opened for GWSR business in Spring 2003 but it has only recently begun to approach completion. Indeed, there is still a vacant space where the newly rebuilt platform's waiting room should be! We should all know that these things take time and money and construction/maintenance stuff has to be stored somewhere. Broadway Station is a restricted site, not at all like Toddington or even Winchcombe! Toddington Ted. Hmmm, interesting comments. The post itself doesn't actually say that the containers are for building supplies, are to be disguised, or that they're temporary. Jo, maybe you could clarify to stop further speculation.